Offer your customers some cool Nirvana merchandise in your store! This wholesale nirvana guitar image discharge t-shirt features a great Nirvana graphic and is sure to be a great seller. 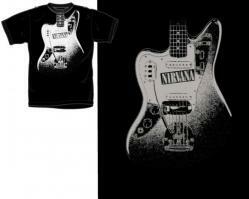 Each wholesale nirvana guitar image discharge t-shirt is an officially licensed product. It is the same merchandise that is sold at live concert venues and at the band's live concerts. Pick up a few wholesale nirvana guitar image discharge t-shirts for your customers today!